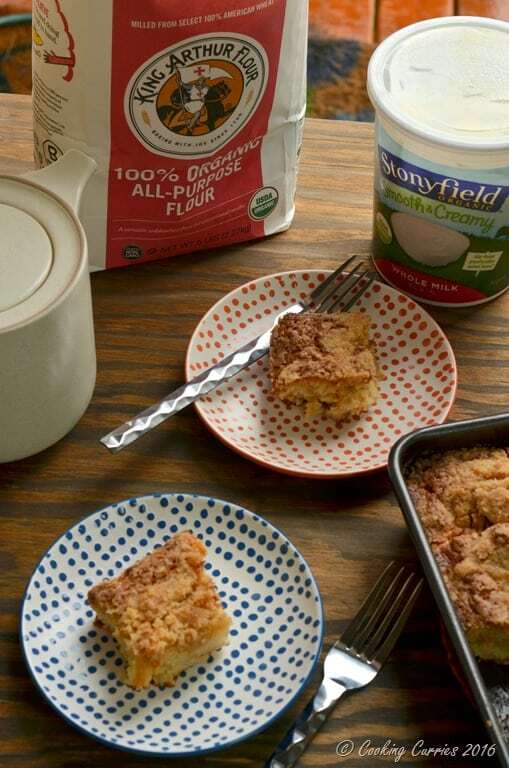 Thank you Stonyfield Organics and King Arthur Flour for sponsoring this post. All opinions, however, are mine alone. Spiced Coffee Cake with bites of seasonal fresh pear and a crunchy streusel topping. A slice of this and some coffee / tea is enough to take your winter blues away! I recently got invited to be part of Stonyfield Organics’ Clean Plate Club. It is a blogger club where we work in collaboration with Stonyfield Organics and other select brands to bring in new recipes for you every quarter. There are some exceptionally brilliant bloggers out there, so do check them out! I have always loved Stonyfield Organics yogurt, whether it was the regular Whole Milk Organic Yogurt that I always bought or the Organic Yogurt smoothies and Organic YoBaby and YoKids, as V came into our lives to the Oh My Yog! line of organic fruit yogurts they came out with a few years ago to my latest obsession of Organic 100% Grass Fed Yogurt ( you have gotta try these, if you haven’t already) So, it was a no brainer for me to be a part of this great community. 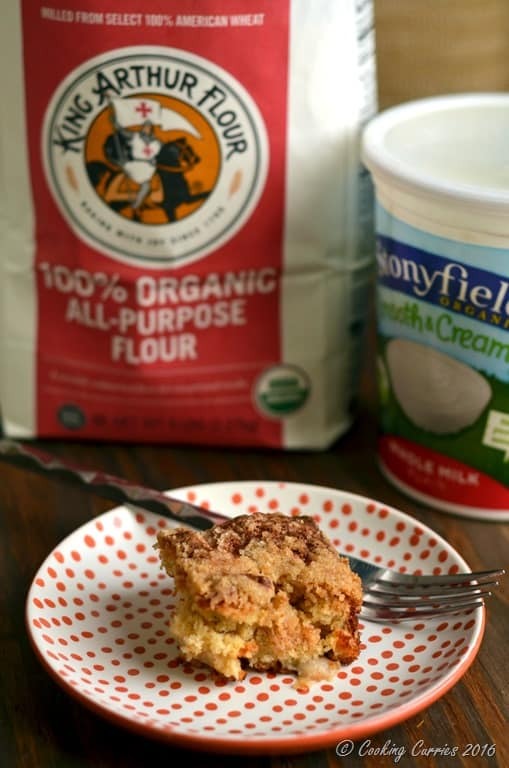 This month, Stonyfield Organics has collaborated with King Arthur Flour and we were sent some of their Organic flours to make something delicious with them. 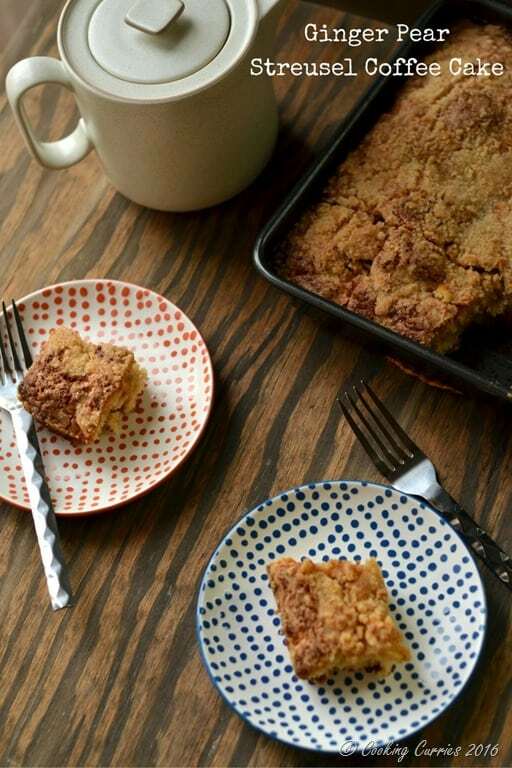 The first thing when I thought of baking something in this season was this delicious spiced Pear Streusel Coffee Cake that I have made many times before. 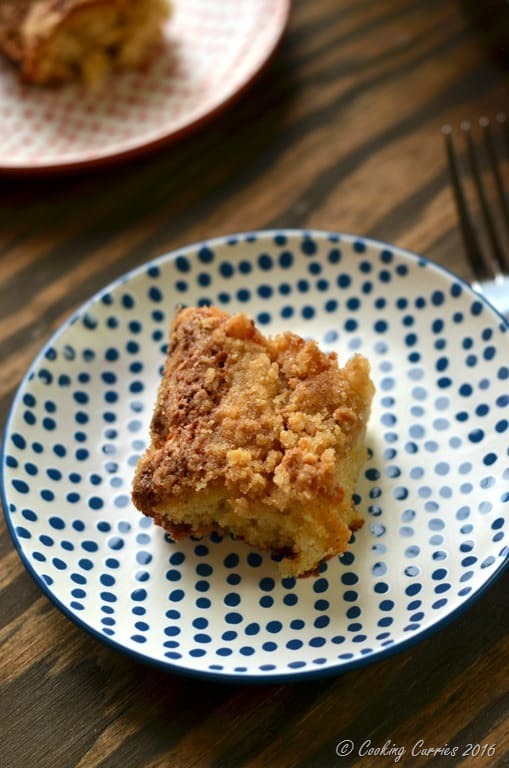 The taste of pear chunks in between the warm bites of spiced cake with the crunchiness of the streusel topping, just imagining that, I couldn’t wait to make them again. I used King Arthur Flour’s 100% Organic All Purpose Flour for this. I also got the 100% Organic White Whole Wheat Flour, which is milled from hard white spring wheat, a lighter colored grain and is to yield milder tasting baked goods, so it will be an excellent substitute for the regular All Purpose Flour. I cant wait to use it and make something delicious with it. I also received some other exciting goodies too. One of them is Silpat, the magical non stick baking sheet for all your sheet baking needs, that I always always wanted. I cant wait to use them to bake some yummy cookies and other goodies for the holiday season! I was so excited to get some of these super awesome measuring spoons, Levoons – with just a scoop, pinch and scrape, these ingenious leveling spoons are a must have in every bakers tool set. 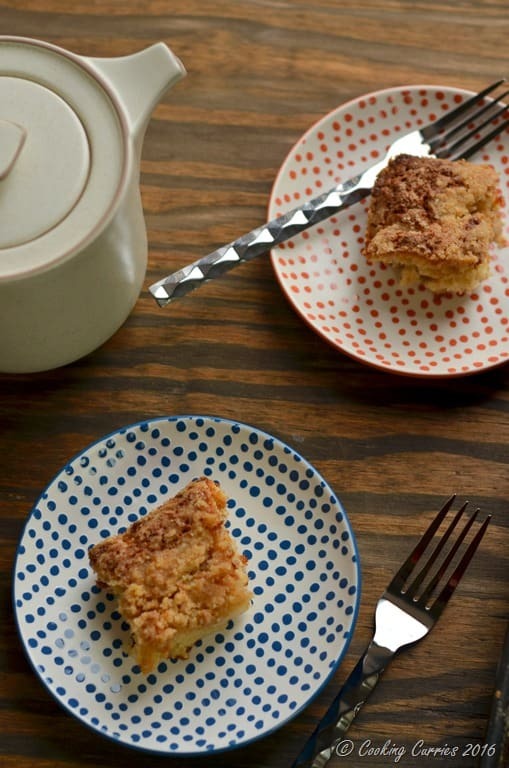 Without further ado, here is the recipe for the Ginger Pear Streusel Coffee Cake. Mix all the dry ingredients – flour, baking powder, sugars, salt, cardamom and cinnamon along with the grated ginger, in a large bowl. Beat the eggs in a medium bowl and add the yogurt and butter to it. Mix well. Pour the wet ingredients mix into the dry ingredients and mix well to combine. Add the cut up pears to it and mix them in. Grease an 8-inch square baking pan and pour the cake mixture into it. Tap to even it out. For the streusel, mix the sugar, flour, cinnamon, cardamom and butter together in a medium bowl. Crumble the butter in between your fingers to mix it in well with the flour and sugar until well combined. Top the cake mixture in the pan with the streusel mix. Bake in the oven for 30-35 mins until the top is golden. Remove from oven and let cool down completely. Cut into squares and serve. YUM! 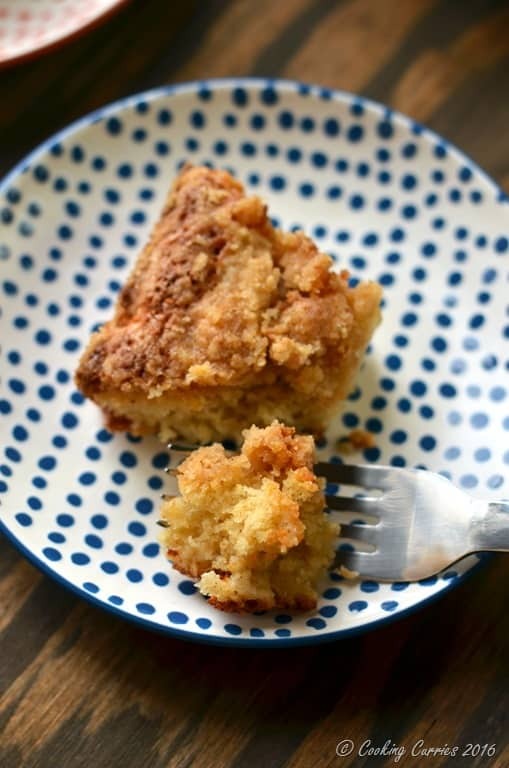 Love the twist on the traditional coffeecake recipe. Must try it with the pear and ginger combo! What a lovely coffee cake recipe. I like how you’ve added ginger and pear and who doesn’t love a streusel topping? I could eat a slice right now! Thanks for sharing.